If elected governor, state Sen. Wendy Davis would consider using “executive action” to expand the state's Medicaid program under the Affordable Care Act in the face of likely opposition from a Republican-dominated state Legislature, she said Saturday in a wide-ranging interview at The Texas Tribune Festival. Had Texas expanded Medicaid to cover more adults under federal health care reform, the federal government would have covered 100 percent of the cost for three years, eventually reducing its coverage to 90 percent. Davis criticized Republicans’ opposition to the offer, which she noted was projected to create as many as 300,000 jobs in the state. “Once again, we’ve got people who are more interested in partisan rhetoric than being leaders for our state,” Davis said. Davis spoke at length during the hourlong interview with Smith about her plans if she wins her race against Republican Attorney General Greg Abbott. She singled out two bills — a repeal of the state’s in-state tuition law for illegal immigrants and an “Arizona-style” immigration bill banning sanctuary cities — as measures she would veto if they reached her desk as governor. Of the in-state tuition repeal, which has strong support among Republicans in the Texas Senate, Davis said she'd "veto it in a heartbeat." Smith began the interview asking Davis about Friday’s televised debate with Abbott. He questioned why she didn’t respond to Abbott when he asked her at the debate if she regrets voting for President Obama. “No, I don’t regret it,” Davis said. She suggested that she didn’t answer Abbott’s question at the time because she thought it wasn’t valid in the “context” of a gubernatorial debate. “I thought it was striking that when he had the one opportunity to ask me a question, instead of asking me who I would be as governor, he asked me who I voted for for president,” Davis said. “It matters because if we don’t invest in them, it will hurt our state economy in the future,” Davis said. Davis was more circumspect when asked about a plan proposed by Democratic lieutenant governor candidate Leticia Van de Putte to tap the state’s Rainy Day Fund for $2 billion to subsidize community college tuition. Despite polls showing her trailing Abbott, Davis expressed confidence that she would win on Election Day. She noted that when she unseated state Sen. Kim Brimer, a Fort Worth Republican, in 2008, her campaign was trailing further at this point in the race than she currently is against Abbott. She also said the reaction she is seeing when she campaigns across Texas gives her confidence that pundits will be surprised by this year’s turnout and outcome. “We have built an infrastructure of people who for the first time in a long time that their voices can really matter at the ballot box in a gubernatorial race in Texas,” Davis said. During an audience question-and-answer portion of the event, one questioner noted Davis’ past criticism of Perry, particularly allegations of cronyism, and asked how Davis could launch a law firm with Brian Newby, Gov. Rick Perry’s former chief of staff. Davis and Newby launched Newby Davis in 2010. Another questioner loudly asked Davis, “Why do you want to California my Texas, our Texas?” a line similar to one Abbott has lobbed at Davis. 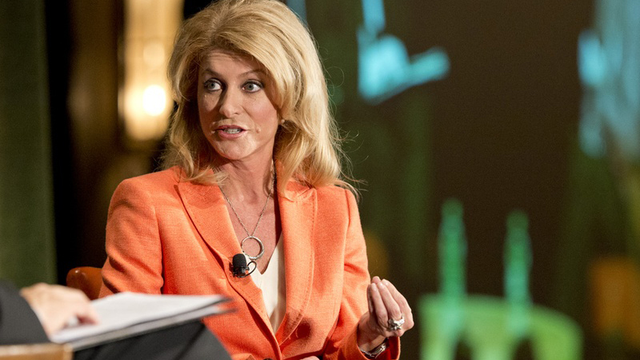 Davis responded that the decision by Texas Republican leaders, and supported by Abbott, to turn down federal Medicaid dollars was sending Texas' tax dollars to California. “That’s California-ing my Texas,” Davis said.